Forza Nuova Banner: Don Biancalani: A Lot of Smoke Little Incense – Forza Nuova U.S.A.
Don Biancalani: a lot of smoke, little incense. “Thus recites the banner appeared in the night in Montecalvoli, a hamlet of Santa Maria a Monte (Pisa), signed by Forza Nuova and addressed to Don Massimo Biancalani, the parish priest of Vicofaro, in Pistoia , engaged in the strenuous defense of migrants and their reception. The meaning of this initiative is clarified, with more details, from a note, published to the press, signed by Augusto Gozzoli, provincial secretary of Forza Nuova that we faithfully report. 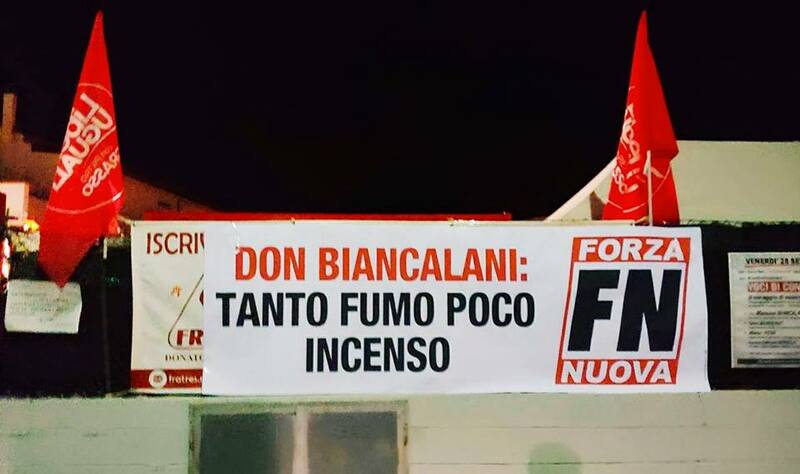 This night our militants have posted a banner in Montecalvoli with an ironic text (“Don Biancalani: a lot of smoke, little incense”) – declares Augusto Gozzoli, provincial secretary of Forza Nuova – to ridicule the presence of Don Biancalani at the party of LeU. A character who is presented as a guru of acceptance and integration – Gozzoli continues – but who actually hosts immigrants arrested several times for dealing with hashish and marijuana in structures that are not in accordance with the law and celebrates ridiculous masses with dancing and drums around the altar. Our goliardic message wants to put to the sedan the unsuccessful integration project carried out by Biancalani in his parish – concludes Gozzoli – and invite him to devote himself more to pastoral activity and to the spiritual care of the faithful. A banner that could not fail to trigger political controversy, vigorously supported by Nicola Fratoianni, leader of Liberi and Equuali, who speaks of a true intimidating act. “The grandchildren of the twenty-year-old squads try again and there is nothing funny in trying to intimidate don Biancalani and even in dealing with the drama of migration – he explains – We are sure that the police will identify those responsible for the crap of this night”. The leader of Leu adds: “We are no longer willing to tolerate that neo-fascist groups become protagonists of such actions.We really hope that the prefect and the chief of Pisa will guarantee serenity and tranquility for our party, preventing any fascist jostling during his conduct “.